“She’s so lucky to have you.” Has anyone said this to you? There are certain comments and assumptions adoptive and foster parents don’t want to hear, and this seems to be an important one. But, I’m going to create some controversy. Why is it so wrong for someone to say your child is lucky to be with you? Adoption comes about through all sorts of avenues. Parents adopt children from other countries, these children have been placed in an orphanage because a parent didn’t want to care for them or couldn’t provide for them. Children are placed in foster care because the parents did not provide a safe environment for them, and the child may then be adopted. And, birth parents choose adoption for their child through domestic adoption. I would agree that in a perfect world, all these children would be the luckiest if they stayed with their birth family, where they were loved and kept safe. Although, to be honest, that’s really hard for me to say. Why? Because I’m selfish, and I adore my kids and couldn’t imagine my life without them. The fact remains that our kids aren’t with their birth families, they’re with us. I find it surprising that parents don’t feel their children are lucky or blessed to be with them. In so many instances, it’s better the child is with their foster or adoptive family than with their birth family (hence the need for foster care and adoption). I’m not belittling the truth that an adopted or foster child has suffered loss. Because of that loss, they are NOT lucky, they are NOT lucky to have gone through trauma (even the removal of child from her birth mother can be traumatic), neglect, or abuse, not at all. Yet, they’ve gone through that fire, and now you’re on the other side, ready to love and support them, and because of that, I think they’re very lucky indeed. In the adoption and foster community many ideas about children, their feelings, birth parents, etc. circle. Just as negativity is contagious, so are ideas that can be skewed or not thought through. Children should not be told they’re lucky to be in their adoptive or foster family, but when someone says to you, “Your children are lucky to be with you,” I believe they are saying it out of kindness. Maybe they feel they couldn’t do what you’re doing, as not everyone is made to be a foster or adoptive parent. The comment, “Your child’s lucky to have you,” can also stem from a persons ability to see where your child would be without you. I know where my kids would be if we hadn’t adopted them, and in those situations they wouldn’t be lucky. So in reality, are most of our children lucky or blessed to be with us? Yes. Would our children be better off where they were before we adopted them – with an absent parent, abusive parent, in an orphanage, or homeless? No, that’s why we adopted them. So, is your child blessed to have you in their life? Yes. I believe God stepped into their lives to give them a new beginning. I don’t mean to offend anyone, nor do I mean to say, look how lucky my children are to have me, no, but I do feel we are all blessed to be together. I don’t think people who make those “lucky” or “blessed” comments mean that our children are lucky to have gone through great loss and pain. I think they see a new family, and how it will benefit the child to have a chance at love. 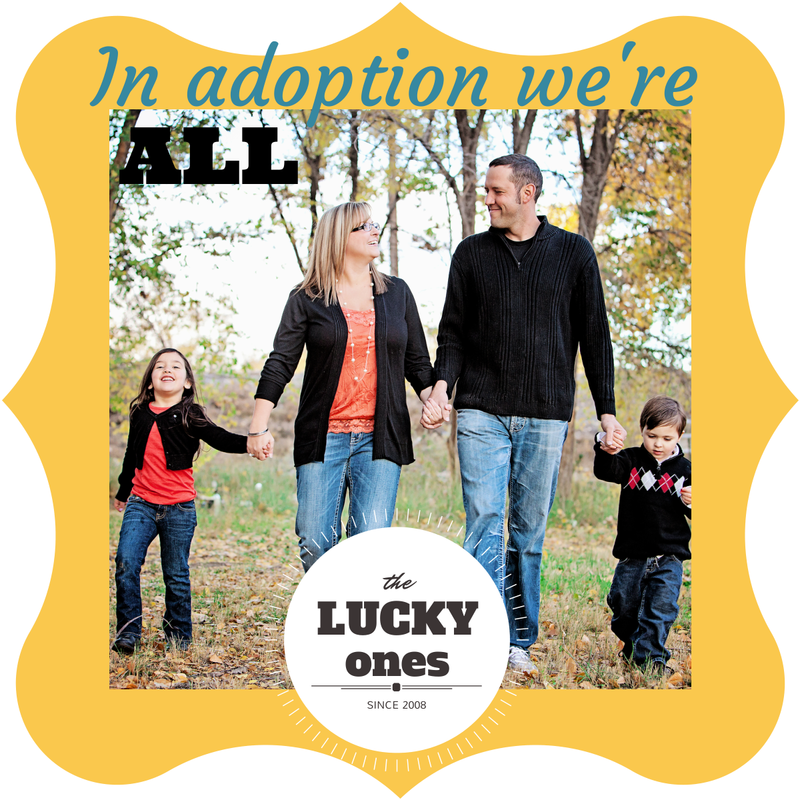 We may want to make a point as an adoptive or foster parent that we’re the lucky ones, and that’s okay. Someone who hasn’t adopted or fostered doesn’t share our perspective of how a child without any blood relation can come in and turn your life upside down (in a good way). They don’t see what a hurting child holds in their hands, and we can share that with others. But we don’t have to discount that our children are blessed now that they’re with us. Has anyone said your kids are lucky to be with you? How did you feel about their perspective? You can receive every post made to Lovin’ Adoptin’ by subscribing in the upper right corner. You can also follow me on social media to get more helpful links and information about Autism, adoption, and foster care. Feel free to share this or any other post with others. Thanks for stopping by! This entry was posted in Uncategorized and tagged adoption, adoption community, foster care, lucky ones, others perspectives, perspective. Bookmark the permalink. this is written perfectly! I have adopted6 kids from foster care. We know the seriousness of their abuse and how “lucky” they are to have just survived! Thank you for making me feel OK to feel my kids are as lucky as we are in being in my home! Thank YOU for your kind words! You are very welcome. Hearing over and over that adopted children aren’t lucky to be in their new home really made me contemplate how I felt, I felt so different than many parents. I am so glad this post has helped someone!